Tom and his guys fixed The Palms today, and she's as good as new, actually better than new. He needed a strip that goes along the bottom of the coach, a trim piece, so I went down to La Mesa RV, they didn't have the exact piece so I got one that's a bit bigger, Tom thought it might work. Unfortunately it didn't, the size was wrong, but he used something from bathtub wall installations that he had out in the shop, and it looks perfect. You'd never know it was a different material than the ones in front and in back of it. The decals are on perfectly, too, so I'm set to go. 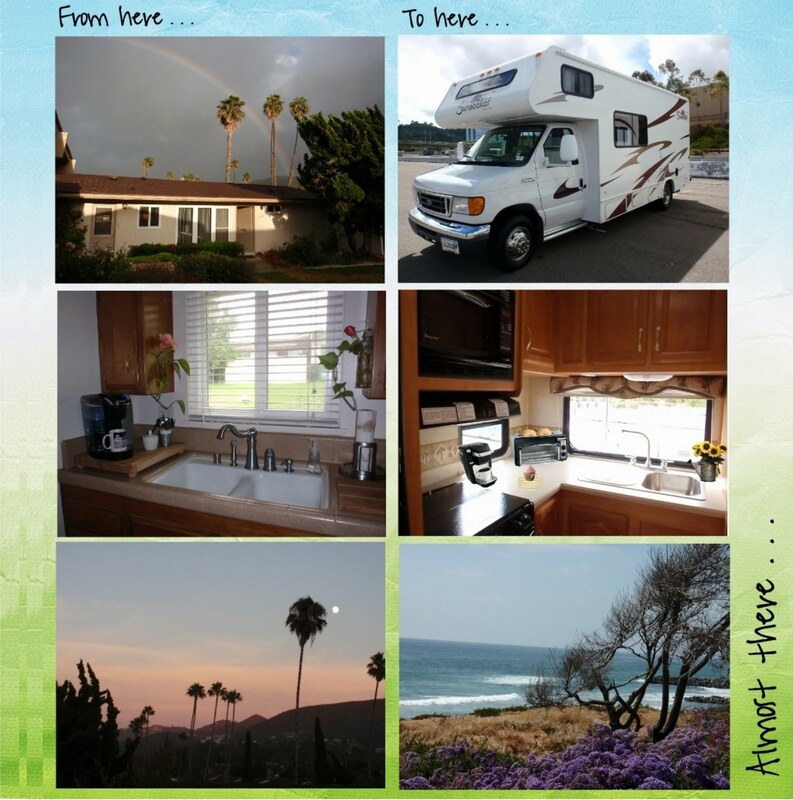 Tomorrow we'll go down to the RV park and get me registered for the month of June, and then back to the office. After work I'll drive back to The Palms, and that will be my home (away from home) for the month. I've been approved for the short sale, and an appraisal has been ordered. The condo is actually my legal address, and I will stay there from time to time to keep an eye on things, air it out and get my mail, etc. I'll keep my sleeping bag there and I've left some clothes, food and toiletries. I'll be able to take nice, long showers there. I guess since I'll have hookups I can do that in The Palms, too, but the condo has a bigger shower and a nice bathtub, which The Palms doesn't have. I'm not ready to walk away yet and don't want to change my address until it sells. It still feels like home, but I do hope it sells quickly. I guess that will depend on the price the mortgage company agrees to. I'm starting to really enjoy taking photos of the sunset. I guess it's hard to take a bad shot of the sun setting at the beach, even more so if there are clouds in the sky. I especially liked the one with the child flying a kite. 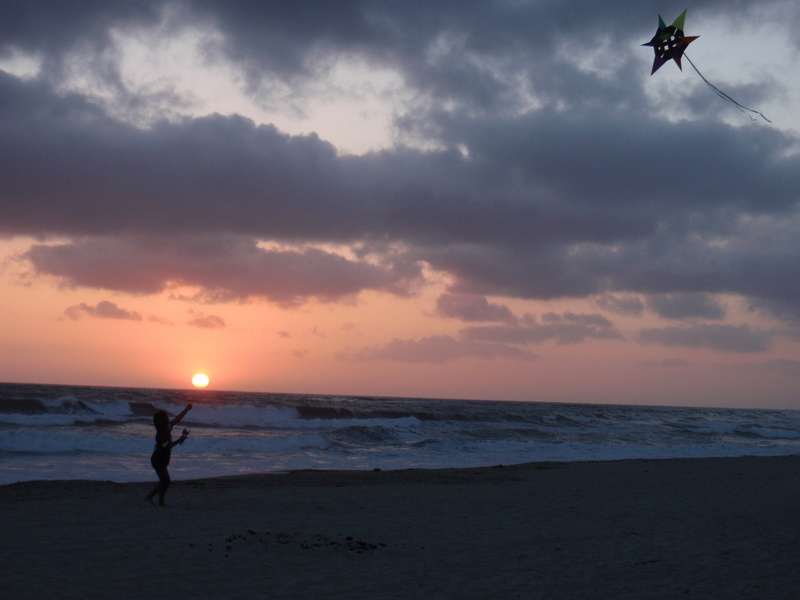 I kept trying to shoot around him, then I realized it was a pretty shot with the boy and his kite. And then one other thing I wanted to show you is the new chair I bought when I was at Costco the other night. It has an umbrella that you can move around 180 degrees, so you can get sun or shade any time of the day. Lumbar support on the back with an extra wide seat. There is a small insulated compartment on the right below the armrest that you can put ice cubes in and up to four drinks.Under the right armrest is a place to put your bottle/can/drink and a storage pocket with a headphone pass-through and a bottle opener. But the best thing, for me, is the footrest. It's adjustable and removable. The chair was set up in the aisle - I don't usually try things out like this, but I sat in it and put my feet up, and it was so comfortable. I could see myself setting it up in front of my closet in the entry hall area and relaxing while reading. It'll be perfect for sitting outside and relaxing. 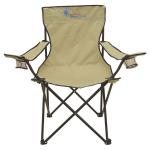 It was only $33.99 - the most comfortable folding chair I've seen. Just in case you're looking for new chairs for summer. Memorial Day, originally called Decoration Day, is a day of remembrance for those who have died in our nation's service, and continue to die for our freedom. Let's take a moment to remember those who have fallen, and their families, too - who have also given so much for us. I love this line-up of little bud vases, I put shells in the bottom of each one. It fits perfectly right here, and I'll change out the flowers, sometimes fresh. Toaster oven and my little vase (it has a small water well with a frog to stick the stem on) and whimsical ornament my daughter gave me for Christmas a couple of years ago - I think she said it reminded her of me (?) and I love it. I've always put her somewhere I could see her. I had this over-the-door hanger outside my bathroom door in the condo. I brought it to The Palms and hung it outside the bathroom door, to hang a coat or sweater or hat on. Then I got out my hanging bud vase and picked one of the purple flowers on the side of the road. I love the way it looks. The bunk. 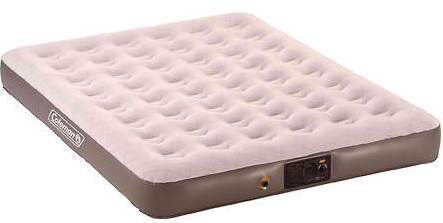 Here's the single inflatable mattress - really comfortable. There's enough room at the foot for storage baskets and extra pillows. Katie on the couch - it pulls out into the most comfortable day bed! There's my Guide, watching over The Palms. See the rounded storage thing behind her? That holds all my kitchen things like spatulas, can opener, beater, potato peeler, all those things that won't fit into one of the three small drawers. It's sitting on a basket that contains one of the lap quilts I made and a couple of small pillows. And that's our new home. It's so comfortable so far, much more than I hoped it would be. I NEVER turn on lights during the day - it's really light and bright in here, and I only need lights when it's dark outside. It was cool and windy all day yesterday, but it did clear up finally, and I got some nice sunset shots, which I'll show you tomorrow. I'm really liking taking sunset shots. You can't do much to mess them up. It's a beautiful day here at the beach this morning. Not a cloud in the sky right now, and only slight breezes. I got here a little after 5 am, good thing, too, because it's 8 am, and all the parking in this area is already taken. The forecast is around 71 degrees along the coast today. It's going to be a super day. For those who asked about the pots, see this post, where I explained where I got them, and for how much. I went to amazon.com and searched Magma nesting pots - 10-piece. This is the best deal I found, more pots for the same money as elsewhere. Maybe I'll make spaghetti tonight, and I can try out two pots and post a review tomorrow. I also have some frozen, sliced, butter/garlic bread that I want to bake in the oven. I haven't used the oven yet, and want to see how I do with that. I used the toaster/oven yesterday, and toasted some bagels. I haven't had a toaster in years. The bagels were perfect, I really liked the way it worked. Katie and I are sleeping like logs on the airbed. Super comfortable, but we usually sleep really well when using the down comforter. I like it so much better than blankets. It seems to be warm in cool weather, and cool in warm weather. The only time we don't use it is when its hot in the evening. Then it really is too warm, but I always hate to store it away during the hot part of the summer. We slept last night in our usual night camp, and I woke this morning at 5:20 to the sounds of a car door closing, immediately followed by a spray of hard rain on the window by my head. I peeked out and one of the restaurant workers was heading to work at the restaurant nearby that opens early for breakfast every day. Katie didn't want to move, so I climbed down, left her up there in the bunk, threw on clothes and drove to the beach. I got here around 5:50. I wasn't worried about getting one of the parking spots I like, because it was rainy, very windy, and really grey out. Kind of a neat day to be at the beach, though, nice and snug in The Palms. We parked and I took Katie out for a walk, came back and made coffee, and settled down on the day bed with pillows and a blanket and my Kindle. It was really nice, I could see the crashing waves through one window and rain clouds moving overhead out both of the large windows. I read for a while, really enjoying my Jack Reacher novel, and it started seeming kind of familiar to me. I kept reading and the deeper I got into the book, the more familiar it felt. I finally realized that I've read it before. I looked up the novels, and Persuader is the 7th of 16 Jack Reacher novels, and was written in 2003. I had downloaded it a while ago when it was offered free. I couldn't remember if I had read that one, and obviously I had, a long time ago. So I deleted it, and will start on a new book tonight. I was really disappointed, because that series is really good. My son and two grandsons stopped by to visit me here at the beach after church this morning. Tom also had with him one of his lifelong friends from our old neighborhood in San Jose. He and Todd went to grammar school and junior high together, and some high school. They have been friends forever, and Todd was here visiting friends, one of whom was Tom. It was so nice to see him. His mom and I were best friends when I lived in San Jose, and it was nice hearing about what she's doing, too. They had plans to go to lunch after church and invited me along. I left Katie in The Palms. It's the first time she's been in The Palms by herself, and she did fine. Tom took my car keys and the key card for the storage lot and said he'll drive it to work on Tuesday. I'll drive down in The Palms. Then Tom will leave me my car and take The Palms to his auto body shop and get the cargo door put on, make the necessary repairs, and apply the new decals. It will be all set, as good as new. I'll get the key card back from him and mail it to the owner of the storage lot, and I'll be done there. When I stopped by the condo on Friday, I had two packages by the front door, and one of them contained my new pots. They are really heavy! Very nice looking and well made. I washed them, dried them and put them back in the largest pot and put the bungee cord around them all, and it was just as easy as the ad promised. I haven't used them yet, but I'm sure I'll get years of good use from them. I got the 10 piece set, 2 handles and the bungee cord are three, then there are two lids, leaving five pots, a really large one, then a big, medium and small pot, and also a large frying pan. I already have a medium sized non-stick frying pan with a folding handle that I got for Christmas from my daughter and son-in-law, and I got a small non-stick frying pan free at Albertson's grocery store when they had a promotion. Kristy and Matt also got me a colander/steamer that has a lid and folds flat for storage. I have them all in the drawer under my stove along with another folding colander, and I still have room to spare. This is 2 colanders, 3 frying pans, 3 lids, four pots and 2 handles. Amazing! Oh, and the baking sheet from my toaster oven. My one big splurge. I think they will be worth it. The other package was a Wagan Tech Smart AC 200 USB Inverter I ordered to go into the cigarette lighter so I can charge things while I'm driving. It has two regular plugs and one for USB cords. I haven't tried it out yet. 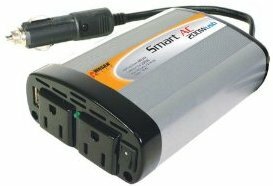 It will save hours on my generator, which I'm turning on when I want coffee or anything that uses an electrical wall plug like my computer and 4G unit. I hope it works well. Katie and I left the beach early today, around 5:00. We went to Costco before they closed to get some flea meds for her. I thought I had some, but I couldn't find the package at the condo last night, and I looked everywhere I could think of here in The Palms, but couldn't find it. I'll treat her this evening and get rid of those fleas. After going to Costco we came back to the beach. We'll stay here again until 8:30 or so, then go back to our night camp. I just took some photos of the inside of The Palms to show you what it looks like so far. I'll upload them and post them tomorrow. I watched this guy for a while. He kept getting wiped out, but kept trying. These beach shots were taken at the same time, but I used my camera's "sunset" setting, and it gave them a different coloring. The waves were really pretty in the sunset. This was so pretty with the waves crashing by the rocks. Little Katie this morning, she's so tired. It's changing between sunny and overcast so far today, and I just started hearing the wind blow outside. Kind of cozy in The Palms, though. I think I'll sign off and read my Kindle for a while. I haven't read it in a long time, but have been charging it so it would be ready. I've started on "Persuader," a Jack Reacher novel by Lee Child. I've love the Jack Reacher series, and have read them all. I downloaded this one to my Kindle quite a while ago. I woke up at 6 this morning, jumped out of bed, put Katie in the car and drove to the RV storage lot. We traded the car for The Palms, stopped and filled the tank and drove back to the condo. I put most of what was left into bags and boxes, got a bunch of my food from the cupboard and fridge, loaded them on the floor of The Palms, and we drove to the beach. We got here around 8:30 and there weren't a lot of parking places left on the street by the ocean, but we snagged one. It's just beautiful here today. I'm so sorry for all of you who are braving terrible weather, I wish you could have a week of days like today at the beach in Carlsbad, North San Diego County. I've worked all day!!! I put things away, rearranged them, changed them again, and then put them in a new place. Lots of you have gone through that, I'm sure. I put the food I brought in the little refrigerator and freezer, and was really surprised that it all fit, and I still have room left over. I didn't bring a lot, but pretty much what I'll need for a few days. I think I'm here to stay. I brought the twin size inflatable mattress, too, and the bedding for it. That's the last thing I did, was make up the bed. I have a nice mattress cover that was from my queen mattress, and I put it around the twin, pulled on the fitted twin sheet, and threw my down comforter/duvet on top. It's going to be very snugly tonight! I'm pretty organized. All my clothes fit, but I have a few coats at the condo still. I guess they will fit, but they'll squish the other clothes, so I'll probably be thinning out the clothes in the next few months. Or not. I have everything packed away now for traveling back to our night time parking lot in Lake San Marcos. I feel safe there, it's where we parked last time during the Estate Sale. I have my fridge and washer/dryer on Craigs List, and have had some calls. Two people who wanted to see the washer, one last night and one other who called today, flaked out on me. Luckily I called the woman from today, so I didn't leave my good parking spot here to go meet her. I have two people interested in the fridge tomorrow, I told them both to call me an hour before our meeting time (7:00) so I know they will be there, otherwise I won't be there. I can't believe people make an appointment for a specific time and don't show. Don't call, and don't answer their phone. Katie and I took two long walks along the sea wall - once early afternoon when I finally stopped for a break. It felt so good to walk with her by the ocean. Then later when the sun was setting we took off in the other direction for another long walk. This is the first time Katie has walked in sand, but it didn't seem to phase her. She is a good little girl and goes potty in the sand around the palm trees that are in the sidewalk. That's all there is for her, except for the concrete, because she isn't allowed on the beach. But she seemed to know that was the spot she should use. It's 8:30 now, and I'm wearing down, so I'm going to close things down and drive to our night camp. My camera battery died, so I'll charge it tomorrow and upload a few pictures from today. Three more days of work! Five more days of work. I've given all my work away, e-mailed my forms and flyers, charts and spreadsheets, templates and contact list, my information file, everything. Thinned out my Outlook folders, went through my desk drawer files, it's pretty much done. Tom wanted my jobs given away early to the other two employees so I'd be there if they had any questions, but I doubt they will. Our Office Manger has been there for nine years, and our bookkeeper for six years. They pretty much know what's up. For the rest of this week and next week I'm going to learn how to do and practice the research job that Tom needs help with when I'm retired. We had a meeting yesterday about it, and I have a lot of information to play around with and see what I come up with. It's something I can do as I want after I leave, I can put in a lot of time, or a little time. The more time I put in, the more money I can earn, so it's up to me. I have the new cargo door and the decals we need to repair The Palms. Next Tuesday I'm going to drive The Palms to work, and Tom's auto shop guys are going to do the repairs. He will drive me home, and then on Wednesday he'll help me get both vehicles to the RV park after work, and I will have both The Palms and my car available to me at the RV park. I'm driving back to Vacaville to visit my daughter's family over the 4th of July and stay with the grandkids during the week while Kristy and Matt are at work. They have different schedules, Kristy's is according to her patient appointments and Matt is with the Home Depot and has varying schedules, so I'll have time to spend with them, too. This might be the last time in a while I'll be in their area to visit. I'm thinking that I won't be on any special time schedule, and if I drive up in my car as I originally planned, it's going to cost me $125 in gas to get there. And I will be paying for my Santee Lakes campsite for the week I'll be in Vacaville since I have a monthly rate and don't want to lose the campsite. Then I have to drive all the way back - another $125. A total of $416. If it costs me $265 to get there in The Palms (assuming an average of $4.25/gal of gas, less if it keeps going down) I think I'll be ahead of the game to do that and then just keep going north after our visit. I'd have anywhere from 1 to 4 days to drive there, and wouldn't have to hurry. If I stay in rest stops or Walmarts at night, I'd save some money. Then Katie and I can sleep in The Palms at Kristy's and have all our things with us. Why not just bite the bullet, check out of Santee Lakes on July 1, and drive The Palms to Vacaville and get started on my "road trip?" I'd have a month to figure out the motor home systems, get her all set up and comfortable for us. I'd like to drive to Placerville and see my old girlfriends, and have a visit. I could keep traveling north and go through Oregon and Washington, two states I'd love to spend some time in. It will be summer and warm, a good time to be traveling north, and not the best time to be in Arizona, another state I want to see (and think about having solar panels installed while I'm there). The more I think about it, the more sense that makes. I could make my way back down through Montana, Idaho, Nevada and end up in Arizona as the weather is cooling down. When I get there, I want to stay for a while in one of the free desert camping spots that I've read about where everyone congregates, and then travel around a little and see more of the state. I'll have to think about selling my car sooner if I do that. Probably through Carfax - I've done that before and felt they offered me a fair amount. I think it's a good plan, and it doesn't make sense to pay six months to camp at a campground and just sit there if I'm not working. It made sense before I was laid off, but not now. I feel like I'm easing into this, and the changes to my original plans are coming slowly and making it easier for me. Whew! Okay then. It's our new plan... I called the RV park this morning and cancelled the last five months of my reservation and they put my deposit for those months on to the June rent, so I'm all set. My cactus is in bloom! I have a big cactus, a prickly pear, on the side of my condo under my bedroom window. I seldom see it, because it's hidden out of the way, and I forget it's there. I think this year is the first time I've seen it in bloom, so I had to take some photos to remember it. This one has 10 flowers on it! I like the way it has different colored flowers on the same pad. Some of the petals have faded, or maybe it was the rain. Still really pretty and fresh looking, though. I Googled Prickly Pear Cactus to see if that's the one I have, and it is. It says it's the Texas State Plant. "The prickly pear cactus was designated the official plant symbol of Texas in 1995. Found in the deserts of the American southwest, the fruits of most prickly pear cacti are edible, and have been a source of food to native Americans for thousands of years. Cacti in general (and the fruits in particular) are still staple foods for some residents of Mexico and Latin America and the prickly pear cactus is raised commercially. The fruit is sold under the name 'Tuna'; the branches or pads are eaten as a vegetable, called 'nopalito' or 'nopales.' "
I guess the little round parts that the blooms are on must be the fruit part. Our HOA's gardener, Jacinto, cuts off the end pieces of mine and another prickly pear across the lawn and brings them home for his wife to cook. I had never heard of cooking cactus until he told me about it. I also have some pretty snapdragons blooming now. And bird of paradise, lavender, lantana, poinsettia, and others. We always have lots of flowers around here. During my estate sale people asked if they could buy my iris bulbs, some of which were in bloom. They are beautiful when they all bloom at once, but they are in the ground, and I thought they should stay for the new owner. My son, Tom, loaned me a folding table, and it's sooooo much easier to use my laptop at the table. And that's about it for today. Just another day in an empty house...but I have Internet! Nothing going on today. I had big plans of getting The Palms and bringing her over to the beach for the weekend, and stealth camping at night. But Friday got busy, Saturday I slept in too late, and today I'm too lazy. That pretty much took care of the 3-day weekend! I have another week in the condo before I move to The Palms. I went to Verizon yesterday to swap out my battery in my 4G, I think that was the problem. So far it's working pretty well. So now I'm going to try to watch a little TV. I still have a bunch of TV shows to catch up on. 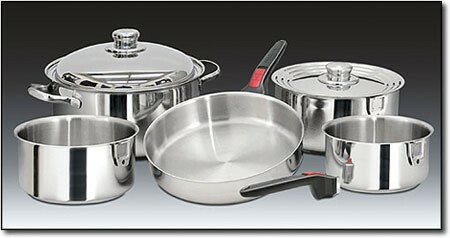 I just ordered a set of Magma nesting pots and pans on line. (Thank you, commenters!) I couldn't find them anywhere in person, but they are highly recommended, and they all fit into the one largest pot. Camping World has the 7-piece set for around $150 on line, and I got a 10-piece for $161 including shipping, right about what the Camping World set would cost with tax, but I got two more pots. I got a blow up bed and sheets today at Costco. It was a Coleman brand, queen, which is what my bed in the RV is - I brought it right down and laid it up there, inflated it, and it hung over the edge a few inches. And it was too tall, leaving me less headroom. So I deflated it and brought it back. I looked all over for a "full" blowup, which is what I'd really like, but I couldn't find one, so I got a twin size at Walmart, and they also had sheets to go with it, that have elastic that goes around the mattress so it won't come off. I'm washing the sheets now, and I'm going to use them here until I move to the RV. I'm getting a little tired of sleeping on the floor. I think that size will work. I hope so. You need a mattress or something to tuck the sheets into that lies on top of the padded mattress that's there now, so the sheets don't show. (I've got the bed put together, so we'll see. I hope it works tonight.) I did see Coleman inflatable mattresses on line, and they have two that might work, too. One is a "full" and one is for an SUV. Both are inexpensive. I got a free chair from the San Diego Blood Bank - when you donate blood you get points, and I was saving mine up for a jacket, but my doctor said I shouldn't donate so often. My iron is actually on the low side now, so I cashed them in for the chair and a $5 gift card from Coldstone. I haven't gotten that yet. I needed a chair, so that was perfect. Speaking of small chairs, my Realtors want to hire me to coordinate their deals. And they have a friend who is looking for a coordinator, too. I think if I wanted to work a lot, I could get a job doing that. 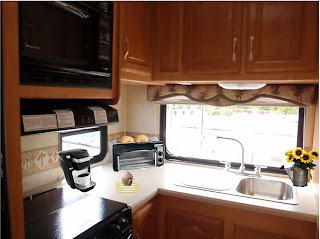 They said I could work for them from the RV, anywhere I was. I have a real estate license and have worked as a loan coordinator and sold real estate. Hmmmmm. I'll have to think about it and see how I do financially once I'm not working anymore. I think I'd rather not be that busy, though. I mailed off my Short Sale documents on Thursday, so now I just wait. They have up to 30 days to respond. My Realtors think it will go, but we won't know for sure until we hear back. He said if they price the condo right, it should sell pretty fast. It will all be done in three to four months if everything goes okay. I got the final payment from my Estate Sale, and I received just under $4,000. My furniture was around 11 years old except my bedroom set, which was much older, and I really didn't have much. It looked fine but was not in perfect condition, and it all went in 3 days, so I was really happy. I was hoping for at least $2,000 and would have considered $3,000 a good thing, so I was very happy with what I got. The total sale was just over $6,000 and I got 65 per cent of that. Seven more days of work! I wasn't going to post anything today - I guess there are a few things I could write about, though. I'm starting to organize things for leaving work. I have tomorrow, four days next week, then three days my last week. So, I have eight more days of work. I'm putting all the forms and flyers and purchase orders, things like that, in organized computer folders so they will be easy to find. Tomorrow Tom is going to sit at my desk with me and we'll go through what he wants me to e-mail him, and what he wants me to delete. What should go to the bookkeeper and what should go to the office manager. I have a lot of his personal things on my computer, a huge Word file that has all the information about his past and present businesses, passwords to all the insurance companies we use, just tons of things like that. It's password protected, and the only way I could keep everything I'd need at a moment's notice at my fingertips. I also have a contact file in Excel that has every contact I've ever had while working there, it must have more than a hundred contacts. That will make it easier for Tom to find the people I've worked with over the years, for every business he's had and every purchase of any size or importance. So, in addition to a couple of special projects and doing some collections, I was busy at work. I skipped lunch and left early. I wanted to stop by The Palms and get some paperwork I needed. I had a meeting at my condo with my Realtors so they could see the property and I had a few questions about the paperwork I'll be sending tomorrow to my mortgage company for the short sale. I told them I only had one chair, so we'd be sitting on the floor. I lied. I remembered I had a child's chair in the kitchen with a box on it, and that reminded me that I had another in The Palms, so I also brought that. It was quite a business meeting - I wish I had taken a photo while they were here! Grace was in a black suit - in the beach chair, Randy was in business clothes - in the monkey chair, and I was in my jeans and sweatshirt in the elephant chair. We were all low to the ground, so the bankers box table worked fine. Just looking at that picture makes me laugh. I think I'll send a copy to them by e-mail. Tomorrow I'll make copies of all the documents and forms and send them Certified Mail, Return Receipt Requested. The thing that compelled me to write the blog today, though, was this. I was sitting here in the beach chair by the dining room window when I saw my neighbor running toward my front door waving his arms, his two boys were standing outside in the light rain in their pajamas. They were all laughing. I thought they wanted Katie to come out and play, so I opened the door. Jeff yelled, come here, come here! I ran toward his place and turned around, and there was a beautiful half circle rainbow with my condo exactly in the middle. A beautiful rainbow over my condo - looks like good luck coming my way? Look closer, do you see it? Isn't that cool? A Mallard on my roof, under the rainbow! I thought that was so neat, and appreciated them coming to get me so I could see the rainbow and the duck! When I came back inside and sat down again, I thought, "I wonder how many things I miss?" Here I was sitting under a duck, and a rainbow, and didn't even know it. I kind of consider things like this to be blessings, like seeing the bunnies scampering around on the property when I leave for work in the morning, and those cool ocean birds that fly in formation when I drive home the coast route, anything like that. But a duck and a rainbow over my head? That's really special! Call me crazy, but I love this stuff. And happy meetings with smiling chairs. Also, April Sola left me a comment that she does have a blog, Happily Hitched - An RV Blog. Very cool play on words - newlyweds - and - trailer hitch. Somehow her photo and blog aren't showing up on my Followers list, but it's a new blog about new, twenty-something RVrs and their dog Lola. If you get a chance, check it out, she's a good writer! I should get my new Verizon Samsung 4G card tomorrow, and will be back in business. It is definitely a problem with the unit because today my son, Tom, let me bring his home. He has the exact same unit, and when I pressed the button, it turned on immediately, which mine has never done. I'm never sure if I'm pressing it too long, and turning it off right after it turns on. It's ridiculous! Tom's turned right on and is working perfectly. He said he's never had a problem with it. I'll be glad to get my new one and not have to worry about it shutting off every five minutes - seriously, every five minutes. Katie and I just got back from our walk to the lake. I haven't been walking much at all, and I could feel it. My legs and lungs needed a rest when we got back. I'm such a slug! Katie loved it, though. I'm sure after June 1 we'll be taking quite a few walks. No more opening the screen door to let her out, and sitting back down. I'll have to go with her on potty breaks once we're in the campground. That will be good for us both. I got my first money orders Friday, and they are supposed to drop off the remainder of the proceeds from the Estate Sale today. It's 5:35 and they aren't here yet. I wonder if they are still coming today. I haven't heard otherwise, so I hope they are. Thanks for the tips about the pots, I'm going to do some research on the suggestions you left me and see what I can find out. I can always get a cheap pot at Walmart and use that until I find the right set. And now, since I have good Internet, I'm going to sign off and see if I can catch up on my TV shows. A big Welcome to Alan McMillan, our newest follower! Thanks for joining us, Alan - things are starting to really move quickly now, and I'm glad you're along for the ride! I’m having a heck of a time with this new Samsung 4G card from Verizon. Since I received it I’ve had really spotty connections. It constantly shuts off, and after five calls to Verizon yesterday, they are sending me a new one, which will arrive Tuesday. I’m hoping the problem is with the unit itself, and after Tuesday it will be smooth sailing. I cancelled my cable TV and Internet service weeks ago, so am now using only my computer and the 4G card for TV, which is really frustrating, since it shuts off every five minutes or so. I’m typing this post on Word, and will do a quick cut/past into Blogger and post it. Hopefully I’ll have a connection long enough to do that. I did find out, though, in one of my Verizon calls yesterday, that Santee, where I’ll be staying in my RV park, DOES HAVE 4G! Yeaaaaah! This 3G is slower than cable Internet, but the 4G is just as fast, and I’m going to be happy to have the 4G for sure. Last night I was so frustrated, I packed Katie and my computer in the car a drove up the street to Starbucks, bought a coffee, and watched two of my TV shows on ch131.com in my car. I’m having really bad withdrawal from TV watching and computer surfing. I don’t have very many TV shows that I like to watch, but geeez, I’d like to see a couple of them. So, my big news is that I am being laid off; my last day of work is June 2! I have 11 more days of work before I’m done. Forever. I had a long talk with my boss (my son) on Wednesday and he would really like to reduce the staff by one person, and since I’m not planning to work beyond December, he wanted to know if I could afford to leave sooner. With unemployment, I definitely could, especially since I won’t have my condo too much longer (I hope). It kind of seems like everything is working out for me to get into my plan sooner than expected. If I still had my condo with a renter, I would want to work through December for the extra security of the six months of full time paychecks and to see if the renter was stable, but… Now I don’t have to worry about it. So that’s what we’re going to do. He had me type of a list of all my duties so he could determine which ones he’ll give the two office employees that will be left. He will still give me special projects as they come up that I can do from The Palms, and hopefully that income will extend my unemployment a bit. He’s also working on another possible income stream for me. It may not be in place until next year, but if it works out it will be a good income producer for me and something I love to do – all computer related. So, about the time I finish unemployment, or before, I may have a good income stream in place. 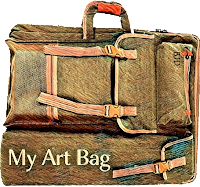 In the mean time, I plan to check into all the links I’ve been collecting for writing, editing, researching, etc. that I can do from the road using my computer. I really enjoy that kind of work, and hope to be able to still access some opportunities in those areas. Katie and I visited The Palms yesterday. I needed a deep bowl to microwave an artichoke. I have NOTHING here at the house to cook with. I don’t have any pots – they all went in the Estate Sale. I have only two pans, and they are both at The Palms. There was a pretty good size bowl, though, in the set of storage containers I got a Costco, and I brought it home and it worked perfectly. On Friday I got more storage containers for The Palms. They had four drawer plastic storage containers, similar to what I already had in my craft room for mostly quilting things, but the ones I had were too wide to fit into my one large closet in The Palms. On Friday I found narrower ones, and got two. I won’t have enough hanging space, so I’ll use those for Lingerie, Tanks, Tees, Turtlenecks, etc. Each drawer will hold one thing, and it will be very organized and easy, and the things that need to be hung, will have room. My label maker is going to be busy! I also got more racks for the kitchen cupboard, to double the storage areas. I put them all in and re-arranged things, so now I have lots more room, and it’s more organized. I also need a few more containers for overhead cupboards. What I have in the cupboards so far fits fine, but when I open them after driving, things fall out and I’m trying to catch them before they hit me. I need some containers that aren’t tall, just enough to hold everything in place. It will be easier to find things, too, if I just have to take the whole thing out, or slide it partway out. Then I can label the outside of the container and see at a glance what’s inside. I want to get a nesting set of pots for The Palms. I remember reading in someone’s blog about some they bought at an RV Rally. I think you can also get them on-line. They looked nice, and she loved them. Said she was sorry she hadn’t invested in a set much sooner. They were kind of pricey, though. If anyone knows what I’m talking about, can you leave me a comment? I did a search yesterday, but with the connection problems I was having, I couldn’t find anything that sounded like what she had. I think they are, maybe, specifically made for RV and boat use. The pots and pans nest and the handles folded or came off for storage. It’s grey and damp outside, with a little rain. But the sun is starting to poke out a little. We may drive down to a free internet location again and watch a Netflix movie. The condo looks great - empty - but great! Well, things are relatively back to normal here on the home front. Here are some photos of my current living arrangements - not for long, though. I have food in the cupboards and fridge, and clothes hanging again in the closet. I am pretty comfortable for now. Before I started all this, I figured I would be comfortable with a bed and chair and that's what I have, and it's working fine for me (and Katie). On June 1 I'll move into the RV park, but will continue to stay here from time to time to keep an eye on things. I'll keep the gas/electric going. The condo looks so empty and clean - it's actually in better condition than when I bought it 6 1/2 years ago. I've made some nice upgrades, and it should be worth more than my purchase price. According to my Realtor, the only comparable in the area to my condo is one that sold in February as a regular sale. It sold for $125K less than I paid for mine. There is no way it will ever appreciate enough for me to sell it and break even. So I am going ahead with the short sale. I'll let you know how that goes. I'm not worried about it. I have excellent credit, and with the credit score hit I'll take with a short sale, I'll still have better credit than a lot of people. The sense of relief I have at this point is incredible. And now I'm going to get a hair cut, and Katie is going for her booster shots this afternoon. I'm keeping my fingers crossed for us both! Thank you, Pidge. I looked at the end of my followers list, and in the followers without a photo I found some new people. So.... Welcome to Steve, a new Follower to Me and My Dog. I checked out his blogs, and it looks like he's really into Poker! Steve, we're really happy to have you join us on our adventure! Welcome also to April Solla and trustnoone1018, who recently became Followers. They don't have photos or blogs that I could find, but I'm sure happy to have you following along with me and my dog, Katie. Yes, a LOT of the stuff in the photos in my last post was not mine. And a lot of it is still here, but it should all be gone tomorrow. I don't think I was taken advantage of, not much anyway. I think maybe this is a normal thing for these kinds of sales. I think they could have been a little more organized, and they could have kept things cleaner (my carpets), and I would have appreciated them getting everything out sooner. My understanding was that everything would be gone on Monday after the sale. I actually agreed to have other people's things, from previous Estate Sales, included in my sale. I didn't realize how much there would be, though. That is why we had a 65/35 split of the take. That way they could continue selling things from previous sales, and increase their take. If I didn't agree, I would have gotten a 50/50 split. They said they also did well with the "other people's" stuff, and previous customers would be happy to get a check in the mail. They hire a crew (two people at my sale since my home is small) and moving vans to and from each sale to haul things to the next sale, they have all their sales equipment, cash register, website, all the business expenses. I don't think they would have netted much without the other stuff being here. They said they did much better than expected at my sale, they keep adding more from boxes of stuff on hand that doesn't fit at first, and that keeps people coming back to see what's new the next day. They had a high volume of lookers each day. My neighbor said people were coming and going all day, and they extended the sale to 5:30 each day because of the traffic. For my stuff, every piece of furniture was sold, anything that really had any value. Only little things were left like dishes, glasses, Christmas ornaments, things like that. I didn't want them to schlep my leftovers to their next sales, so I opted for a "buy out," they called a couple of companies who will buy out the remainder after Estate Sales, and I was offered $250 for what was left. I thought that was very generous, and it was still a 65/35 split, so the deal was made. About half of the things are gone now, and about half of what's left is packed up in boxes, and will be gone tomorrow. The carpet cleaner is coming on Thursday. One thing to remember is that when people have Estate Sales, at least around here, the owner of the "estate" has usually died or moved to an assisted care or similar residence. They are gone, the sale is held, the money paid and everyone is happy. I'm still here, and popped in almost every day. I wonder if that is unusual for them, and if I was just too "present" at my own sale. If I had gone to visit my daughter for a week or so and then come back, I wouldn't have seen all this, and it wouldn't have been a problem. Do you remember how your house looked when you were moving? When most of the stuff was boxed up, there were creases and marks in the carpets where the heavy furniture was, cobwebs and little pieces of things left from moving out the big stuff. Just kind of messy. That's what my place looks like now - other than the carpet stains, which hopefully will be taken care of. And I do have to say, they called me at least once a day to keep me updated on what was happening. I appreciated that. And now that it's almost over, I can't imagine any other way I could have gotten rid of everything in one week. When I get the final payment, I'll let you know what what my total was, might as well. Considering all my furniture was at least ten years old, not in perfect condition, and I didn't want it, I'll be very happy to get the check. They give their customers a money order or Cashier's Check, the first one is 65 percent of the cash they took in, the second one depends on the "hold time" the bank places on the checks deposited. When they clear, usually 3 to 5 days, then I'll get the remainder. They gave me an approximate number, but I'll tell you when it's final. Maybe it will help someone else out there make a decision, and you'll know much more than I did. Soon this will be over and I'll be bringing The Palms to Santee Lakes, and Katie and I will be full-timers, and this will be an interesting memory. We move on June 1!!! At the beach on Saturday, I pulled out the couch and Katie and I took a nap and tried it out. It was really comfortable! Just a reminder - love my kitchen! OMG! Wait till you see this! I borrowed my neighbor's vacuum and a sheet to lay on the carpet, then put my open sleeping bag on top of a quilt so we can sleep in reasonable cleanliness. Just beware if you hire a company to do an estate sale. I can't believe they are all like this, do some checking of references before signing the contract. I had a comment on my blog that a follower is in the middle of a short sale. I have been thinking about doing that. I just learned about short sales from two ladies at my Estate Sale. They both did short sales on their homes and explained how it works. One has a realtor that specializes in short sales and I’m going to call her tomorrow. I will never move back to my condo, I can’t afford the mortgage when I retire. I’ve already lost my $70,000 down payment because of the downturn in the market, and now I’m thinking, why bother with renters? It will never appreciate to the point where I can sell it and break even, why not just let it go. I just had a woman call me to rent my place, and she explained that she had to let her home go, but her credit report was still 720, so it didn’t hurt her too much. That’s 4 people this weekend that told me they had a short sale, and I've never talked to anyone before about short sales. I’m wondering if someone is trying to tell me something?!? I have 90 Followers now! Every so often the numbers are strange. I had 89 before, and now it shows 90, but I don't see any new photos. I hope I'm not missing anyone, the photos are added at the top where we can see them and there aren't any new ones after Bob, so if I've missed anyone, I apologize.